We’ve yet to have a real snowstorm here in Southern New England, but yet we are embracing the winter fruits and vegetables and pretending we have snow on the ground. Grapefruits are everywhere these days as they are in season until early April. They are one of those fruits that I really want to love. They are gorgeous and the smell is one of my very favorites. I once had an amazing massage and exfoliation with a grapefruit sugar scrub. I smelled like grapefruit for days after and loved every second of it. As a young girl I was somewhat enamored with grapefruit. My grandfather would eat one nearly every morning. We would buy them and I would have to pour more sugar on than was really worth it (or healthy for that matter). I recently read that the grapefruits of my grandfather’s day were different than those today- they, remarkably, might have been more bitter than the grapefruits of today. In his day people might have been more likely to sprinkle the tops with salt rather than sugar. It has been said that the taste of the salt diminishes our ability to taste the bitterness. I haven’t tried that trick yet, but I might have to if I want to eat a grapefruit as is. In the meantime, we have found a way to ditch most of the bitterness and enjoy the loveliness of the flavor all while making the entire house smell of grapefruit in the process. We started by dehydrating whole slices of grapefruit and also peels of the zest. In a 200 degree oven we placed the peels for about two hours. We were very careful to avoid as much of the pith as possible because that is where the bulk of the bitterness lies. Our slices took a lot longer- about eight to nine hours in an oven set to 175. They came out glistening and gorgeous. Truth be told we are only going to use them for decoration- but couldn’t resist drying them. While all of that was going on we did some research on vanilla cakes. Vanilla cake is something that we’d really like to learn by heart and have in our baking repertory. It is so versatile and is completely lovely in the winter especially. It’s one of those cakes that lends itself so well to many flavors and to us is just perfect. In our search for the perfect cake we found that no two recipes are the same. Some called for 1 1/2 cups of flour, some 3 cups. Some cake flour, some all purpose. Some 2 eggs, some 5. None of the measurements were the same. Which made us think we would really love to make all of the cakes we read about and then taste test them to see the differences first hand. But that will have to wait for another day. Today we were all about the grapefruit vanilla combination. These cupcakes turned out airy and flavorful. Using a standard vanilla cake recipe, we ground our dehydrated grapefruit rinds until they formed a powder and then added one tablespoon to the flour mixture. We also added one teaspoon of juice to the butter/salt/egg mixture. We know, we could have done this by simply zesting the grapefruit rind…but we were up for an experiment. The salt did balance the slight bitterness, as did the buttercream frosting, but it wasn’t nonexistent. These are really the perfect cupcake to enjoy with a cup of tea. 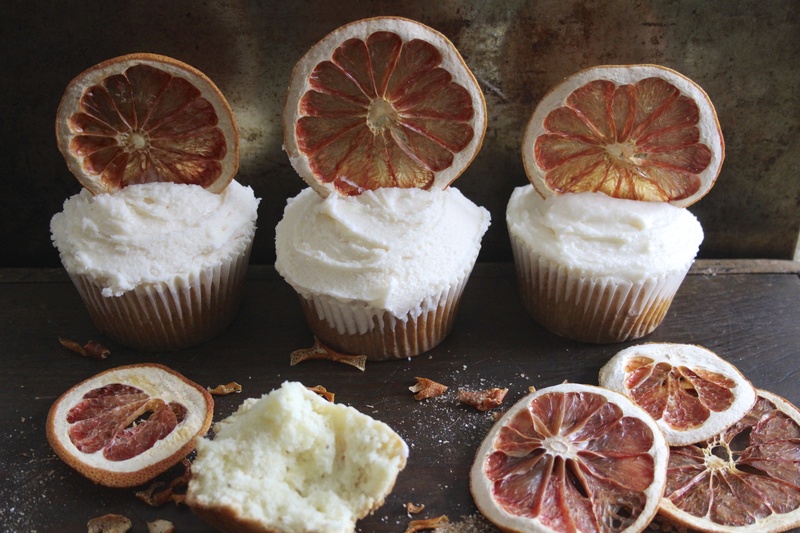 The addition of grapefruit juice to the frosting provided a grapefruit flavor which was subtle and lovely. We substituted grapefruit juice for half of the required cream. We’ve yet to find a buttercream which is super for piping and that we really love, so if you have a favorite recipe we’d love to know what it is!